Priene is a Greco Roman site that is located 17 mi. [28 km.] south of Ephesus and 10 mi. [17 km.] 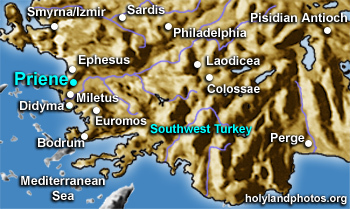 north of Miletus (“as the crow flies”). It sits on a ridge that overlooks the Meander Valley below and to its south. This city was built about 350 B.C. according to the grid plan promoted by Hippodamus of Miletus – who lived a century earlier. This in spite of the fact that the city is situated on a steep hillside, and this results in some very steep streets! Alexander the Great visited the city in the late fourth century B.C. and helped finance the construction of the Temple of Athena. Although not mentioned in the Bible, probably the elders of the church of Ephesus passed through or by it on their way from Ephesus to Miletus where they met with the apostle Paul (Acts 20:15–18). To view the famous Temple of Athena at Priene Click Here.